Kailyn Wright is the associate director of Project REACH at Cazenovia College. Wright's work through REACH supports students by providing academic counseling, teaching them time management and study skills, and much more. She works with various staff members at the college to coordinate Project REACH programs. Project REACH is a federally funded student support program on campus, and has 160 to 175 students in the program at any given time. When asked what she was most proud of, Wright talks about her colleagues and their devotion to helping students. "I'm really proud of this department, of REACH, with a group of devoted staff members who do so much for students." She adds, "They help problem solve, listen to, and care for students." Wright's favorite thing about working with Project REACH is seeing students succeed and reach the goals they set for themselves. She explains, "I really like that I work in a job that helps change the profile of who obtains a higher education degree in the United States." 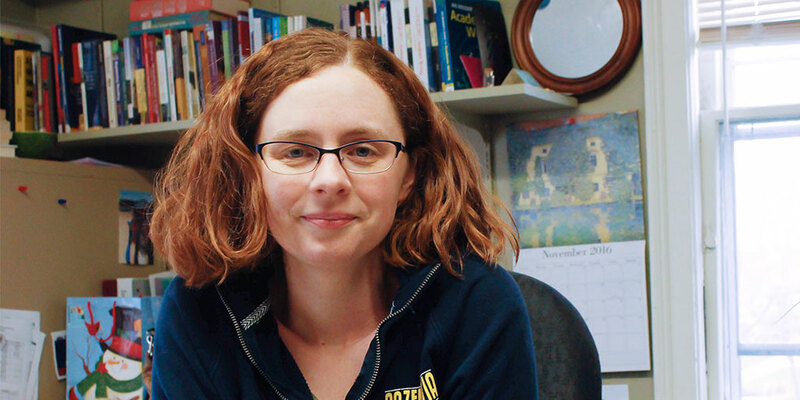 When Wright is not working with students and staff, she enjoys putting together puzzles, folk dancing, reading and drinking tea – these last two being her favorite thing to do on a Saturday morning. You can also find her walking her dog named Goat. She also has a black cat named Severus, inspired by the popular Harry Potter series. Wright really enjoys working at Cazenovia College and in Project REACH. "I love the Caz community. I love working here, I love the students, and I love having such devoted colleagues."